Wordle is fun. No doubt about it. Your text-chunk of choice, arranged and colored and sized by most-used words, in a format you can alter and edit and shape to make it most pleasing to your eye. 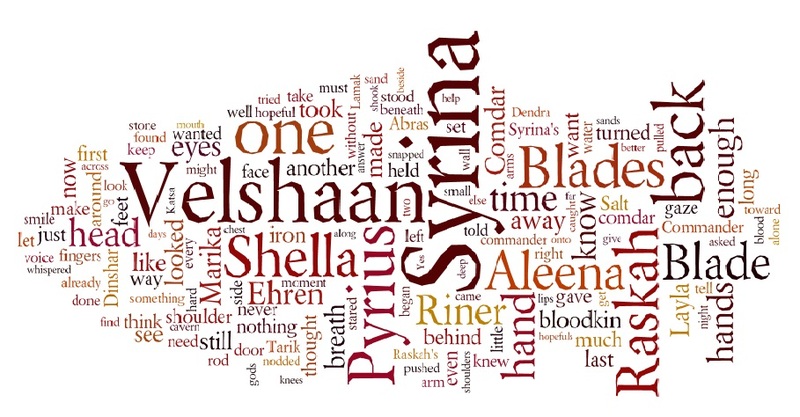 First, take a look at the Wordle for Sand of Bone. Much of the Wordle looks as I’d suspect. Names of viewpoint characters are prominent: Syrina, Pyrius, Raskah, Shella. But I didn’t expect secondary characters to show up as such large pieces. There isn’t anything wrong with that, but it did surprise me. And that word in the middle–Velshaan–should indeed be as large as it is. I like that. So then I look at the other words, and it’s there clues of my writing style–good and bad–expose themselves for interpretation. The high occurrence of Blade and Blades–no problem. It’s a title and an occupation at the heart of the story. But what’s up with one, back, hand and hands? Just how many ones does a single manuscript require? And is that back as in the body part, or returning to a former state/location? As for hand and hands… Let’s lump that together with some slightly smaller words. Head, feet, eyes, fingers, chest, shoulder. Smaller still and you’ll find lips, arms, mouth, chest and knees. Then you can add in words that refer to what all those body parts do: turned, looked, see, smile, nodded, stood, gaze, shook, held. Then there are words that look suspiciously like fillers: enough, now, around, another. Those show up with frequency enough (see that?) to merit a word search and replace consideration. Some words surprise me by not showing up as often as I expected. Sand and sands are awfully small, considering the location, the beliefs, and the slang. I honestly thought the words showed up much more often. Ditto for blood, hopefuls, gods, and Katsa. I wonder if, out of concern for too obviously pushing an idea, I actually gave each appearance of those terms a weightiness out of proportion with its prevalence. A few words surprise me by showing up at all. Really, help? I can’t even think of where help would often show up a couple times, let alone enough times to be considered a top 200-odd words in a manuscript exceeding 135,000 words. That’s a problem. And why is time so large? I don’t recall considering time to be an element critical enough to merit as much “screen time” as the Wordle implies. And I find it a tad amusing that Yes shows up often enough to make the Wordle. It makes me wonder if my characters are asking too many questions everyone else already knows the answer to. Yet one more thing to keep in mind as I head into revisions. Interesting and potentially useful. I never thought of using word clouds as an editing tool, but it makes a great deal of sense. Thanks! And it’s fun, and it looks cool. 🙂 I’m glad you found it helpful! Huh! Great and FUN idea!